Anguilla is a British Overseas Territory, and it is no wonder why people choose to spend their vacation there. Anguilla is, after all, an island in the Caribbean, where the white sandy beaches go on for miles, and the clear blue water makes it look like taken out of a magazine. However, even if Anguilla is British territory, it does not mean that they share a visa policy. Of course, the United Kingdom maintains its sovereignty over the region, but Anguilla’s visa policy has its own rules. Just like any other jurisdiction, Anguilla has its own list of visa waiver countries. Of course, British citizens are not required to apply for an Anguilla visa if they wish to spend their vacation there, and neither are the citizens of the European Union. The citizens of other 60 jurisdictions fall under the same rule. Nevertheless, the visa-free period is limited to 3 months. If you want to stay more than that, you need to apply for a visa no matter your nationality. Another thing that is worth mentioning is that people who hold a valid visa or a residence permit issued by the United States, Canada, or the United Kingdom can also go to Anguilla without applying for a tourist visa. To find out which rules apply to you, you can use iVisa’s Visa Checker. You can find it in the right top corner of this page. Just select your nationality from the drag-down menu, and choose Anguilla as your destination. The result will show up in just a second. If you are not from a visa-exempt country, the result will direct you to the nearest embassy of Anguilla, and you can find the contact information there. Unfortunately, iVisa does not support an Anguilla visa at the moment, but we can still provide you with the information you need to get the visa application process started. Below, you will find some things that you will find useful. 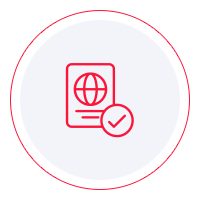 As far as the requirements go, you need to make sure that you have all the information and the documents that are necessary for the visa application process. First of all, you need a valid passport. Even more than that, the passport you have must keep it validity for at least another 6 months from the date of arrival in Anguilla. At least one blank page is necessary. Other documents may be required as well. For example, you need one or two recent photographs of yourself. Depending on your travel circumstances, the required documents can vary. However, for more information about the requirements, we advise all applicants to call the embassy and find out precisely what they need. While the information online comes in handy, it should be used as a reference only. The most reliable source is the embassy itself. We regret the fact that we cannot help you with the Anguilla visa application process, but as soon as we are able (when Anguilla starts issuing electronic visas), we will work to make that possible. Until then, pay attention to the requirements given by the embassy, and you should get your Anguilla in no time.